I both love and hate shoe shopping; it often takes me trips to several stores and malls to find that one perfect pair. It’s not that I’m picky, because I’m really not. I think a lot of shoes are incredibly cute, and I often don’t mind paying upwards of $70 or $80 for one pair of shoes. Most commonly I run into problems finding the perfect fit. Though the foot measure device at shoe stores declares me a 6.5, I usually end up buying a 7 or a 7.5 depending on the brand. When I first began talking with Aerosoles about reviewing a pair of shoes from their new collection, I grew a little bit nervous. What if I chose the wrong size? What if the fit was totally wrong? That’s why I don’t order shoes over the internet. We used to have an Aerosoles shoe store in Utah, but it left several years ago, and I don’t know of any store that carries the brand so that I could peruse the collection first. I took a deep breath, made a decision, and requested a size 7 for the Playhouse style shoe. As much as I love the look of higher heels than the 2 1/4 inches of this particular pair, I just cannot wear heels that add more than 3 inches. The Playhouse shoe has 5 different colors to choose from: black leather, brown leather, leopard tan, and gray fabric. I chose this particular pair of shoes because it would add a few inches to my height and because they looked practical and comfortable. I also loved the look of the gray fabric, which would nicely complement much of my casual business attire that I often travel with. Finally my Aerosoles arrived, and it was time to put them to the test. I began asking myself the usual questions that run through my mind: What if they don’t fit? What if they hurt? Will my feet get blisters? Will I comfortably be able to walk around in them? Will they sit in my closet, unworn and gathering dust? When I slid my feet into the shoes, I felt like Cinderella. Was it possible that I had just found my perfect pair of shoes? 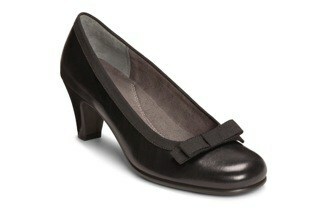 The Playhouse shoe is so comfortable, and it feels as if it had been customized just for my feet. I experienced no uncomfortable pressure on the tops of my feet, and the heels did not slip when I walked. Most importantly, they are well cushioned and flexibly bend while I walk. I don’t feel like I’m wearing a brand new pair of shoes at all; they already feel broken in. When I finally wore them during an evening out, I experienced no pain or discomfort the entire night; when I got home and slipped them off, my feet had no aches and I had no sores or scrapes from the shoes. The next time that I need shoes for a special occasion or just as a treat to myself, Aerosoles will be my first and last stop, online or at a local retailer which bountifully stocks the Aerosoles brand.